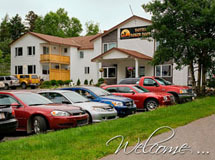 There are a number of great places to stay in the area surrounding the Exploits Valley Salmon Festival venue. The closest licensed hotels to the festival are listed below. 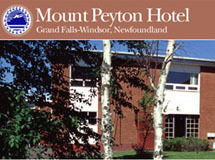 Whether you're just passing through or simply finding it hard to leave, the Mount Peyton Resort and Conference Centre has what you're looking for. It is your home away from home! Its offering of a full-service hotel, in addition to its motel and efficiency units right across the street, provides you with the best of both worlds. Nestled amongst birch and aspen trees on the banks of the Exploits River, our 4½ star Riverfront Chalets provide the ideal home-base for exploring the treasures of Central Newfoundland... Year-round. Amenities: Relax with friends in a natural outdoor environment. The attention to detailed landscaping creates a dream garden with boarded walkways, rock walls & an outdoor fireplace. Enjoy the saltwater hot tub nestled in the landscape with a fantastic view of the river & big sky! 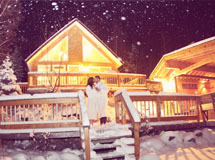 Each luxury chalet sleeps 6, has 2 bedrooms, Jacuzzi, leather furniture, satellite TV, WiFi, private deck, & Weber BBQ. On-Site: River rafting tours, hiking, canoe/kayak/bike rentals, snowmobile/snowshoe rentals & guided tours. 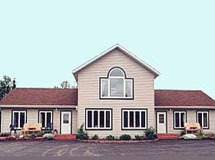 Hotel Robin Hood is a small, family-operated business nestled in the heart of Grand Falls-Windsor. With well appointed hotel rooms and new jacuzzi suites offering two-levels of luxury. Relax in spacious, individually decorated rooms and sleep among fresh, crisp-clean sheets. Enjoy a free continental breakfast each morning, high speed internet throughout the building and most importantly, friendly staff who are ready to assist in any way possible. Relax at Hotel Robin Hood and Suites while enjoying your unforgettable adventure in Central Newfoundland. 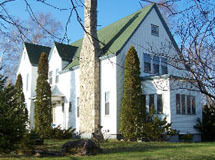 Carriage House Inn is a boutique bed and breakfast offering warmth, comfort, and pleasant memories. Whether it's a bed & breakfast atmosphere or the privacy of a country inn you're looking for, you will find it at the Carriage House Inn. Close to downtown and shopping. Easy to find, take exit 20 to Grenfell Heights and turn right on Grenfell Heights we are on the left. You will get Comfortable beds, luxurious linens, and a hearty breakfast. 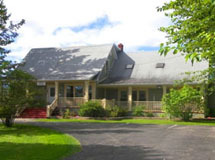 Open year round, the Carriage House Inn is located in the breathtaking Exploits Valley and adjacent to one of the best salmon rivers in Newfoundland. Nestled in the heart of the scenic Exploits Valley our location is ideal for travelers. Quiet and exceptionally clean, our home is an outstanding property, one of the oldest in the town. Built in 1939 by the A.N.D. Co. the house boasts wonderful attention to detail and beauty with leaded glass windows, high ceilings with curved moldings and French doors still as they were more than 60 years ago. Hill Road Manor, rated Four Star by Canada Select has large, well-appointed rooms, space to relax in the home and gardens. We offer accommodation and hospitality at its finest. Located at 72 High Street in Grand Falls-Windsor, Riverside suites is your home away from home. A great location for a family or couples, this suite is equipped with a master bedroom and second bedroom, as well as a kitchen with oven, microwave, & full sized fridge. Also in the suite, is a living area with couches, dining area, flat screen t.v., and a private bathroom. WiFi is available throughout the property. Located in Bishop's Falls, just off the highway in the centre of the island portion of the province, Brookdale Country Inn is the perfect site from which to explore the secrets of our island home. Just minutes away, 15,000 year old icebergs from the north meet North America's largest concentration of Humpback whales migrating from the south. Come and experience our dramatic coastal shores where there are landscapes not found anywhere else in the world. Island complexes, sea stacks, eroded cliffs and spectacular beaches are all within your grasp.